This week Twitter announced that over the next few days its profiles will be given a very Facebook-like makeover. According to a post on the official Twitter blog, our profiles will soon be getting a major redesign, which will include a larger photo, a HUGE Facebook Timeline-esque cover photo and the ability to pick your best tweets to feature. We think the redesign actually looks great and allows us to see more of the stuff that matters, the problem is it could change the way we use Twitter a little. Twitter is all about sudden thoughts and updates, give people the ability to feature tweets and pin the best ones to their profiles and it all becomes a little slower and more thought out. For those who embrace social media it may well be a welcome change, for those who hate Facebook and everything it stands for, the new makeover might all seem a bit too familiar and painful. 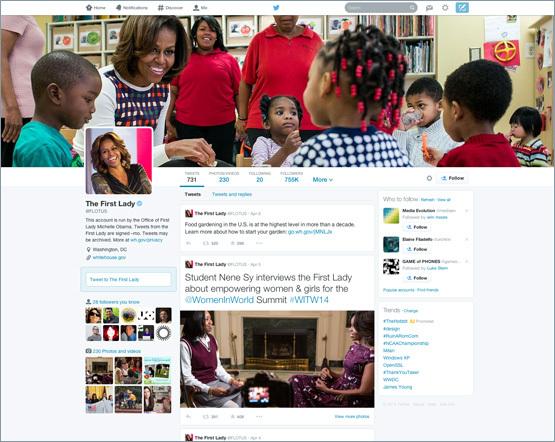 If you’re wondering what the new redesign looks like you can keep an eye out on your profile over the next week or so (they’re all going to be reverting very soon) or just go and stalk Michelle Obama, here’s is all shiny and new: @flotus.